Happy Saturday SCT friends! We’re excited to have Emma Goddard, Stampin’ Up! Artisan Design Team member here today sharing a little love! The Be Mine Stitched Framelits Dies from Stampin’ Up! are filled with lots of different stitched hearts, as well as my favourite, the scalloped stitched edge. This is perfect for creating projects with layers and cute edges! For the set of projects I am sharing with you today I have focused on using the scalloped edge die alongside the Brights Designer Series Paper for a fun birthday celebration. This technique and projects would work with any combinations of patterned papers to really change up the look. Cut Whisper White Cardstock base to 21cm x 14.8cm – scored and folded to 10.5cm x 14.8cm. (or 8 ½” x 5 ½”- scored and folded to 4 ½” x 5 ½” ). Using the Rectangle Stitched Framelits Dies I have cut the second largest from the set, in Whisper White Cardstock. Cut a piece of Whisper White Cardstock (8cm x 11.5cm or 3 ¼” x 4 ½”) and the embossed using the Corrugated Dynamic Textured Embossing Folder to add texture. Tie around both piece of the ribbon around the centre piece before adding to the card. You will need approx. 55cm or 22” of both Gorgeous Grape ¼” (6.4mm) Mini Striped Ribbon and the Whisper White 1/8” Sheer Ribbon. I have then stamped my chosen sentiments from the Itty Bitty Birthday Stamp Set for all three projects at one time. These have been stamped in Versamark onto Basic Black Cardstock and embossing in White Stampin’ Emboss Powder. The next step is to create these cute hearts! 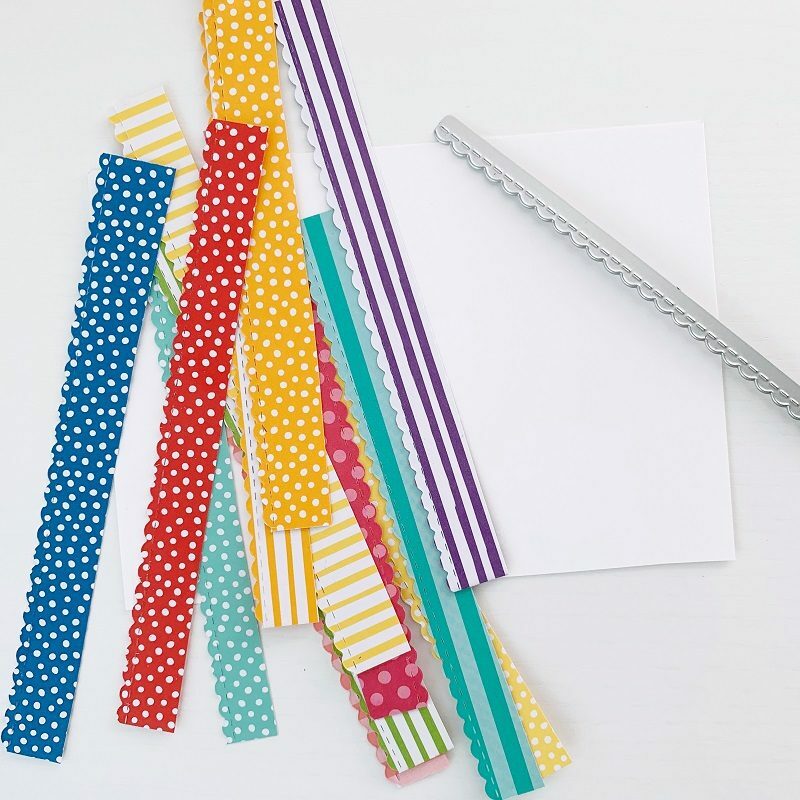 Firstly, die cut out approximately 12 strips (1.5cm or ½” wide) of patterned paper using the scallop border die and layer these on to a scrap piece of Whisper White Cardstock. If you would like to have the ruffled look to your heart, make sure you are only using a thin line of glue along the top edge (away from the scallops). Once all your layers are in place, die cut out the stitched heart. You will want to create three of these, one for each of your coordinating projects. 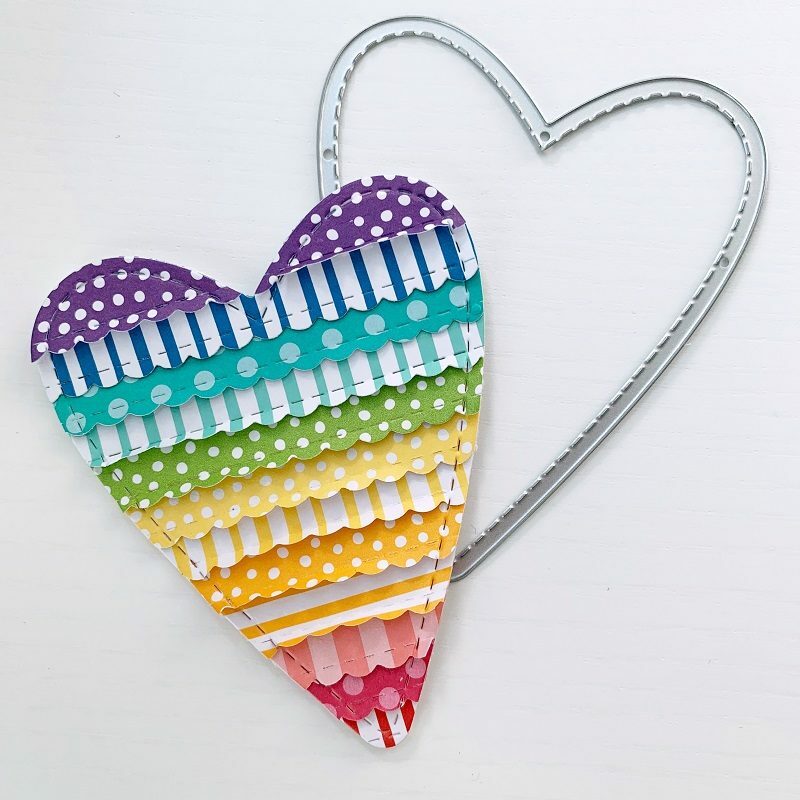 Add this heart to the front of your card using Stampin’ Dimensionals to really make this pop! Complete the card by adding your chosen sentiment and some Rhinestone Basic Jewels for some added sparkle. These Mini Pizza Boxes are perfect for a treat or some mini cards, they come ready to assemble and decorate, which is ideal when you are busy getting ready for a party! Cut a piece of Whisper White Cardstock to 8.5cm x 8.5cm and using the scalloped edge boarder on each edge to create the decorative square. Cut a piece of Whisper White to 8cm x 8cm and emboss with the Corrugated Dynamic textured Embossing Folder. Tie around the same ribbons and add your heart and sentiment. 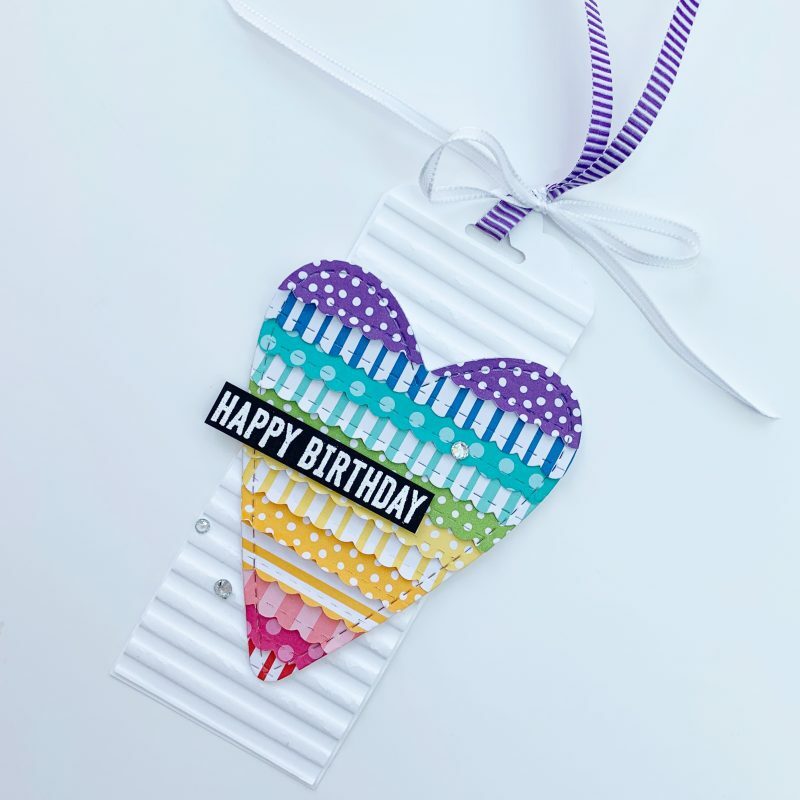 Cut a piece of Whisper White Cardstock to 5cm (2”) x 13.5cm (5”) and use the Scalloped Tag Topper Punch to create a quick and easy tag. Add a layer of Whisper White Cardstock (11.5cm x 4.8cm or 4 1/2”x 1 7/8”) embossed with the Corrugated Dynamic textured Embossing Folder. Add your heart using Stampin’ Dimensionals. Hope you enjoyed today’s tutorial! Would you like to send some messages from the heart? Our friends at Stampin’ Up! 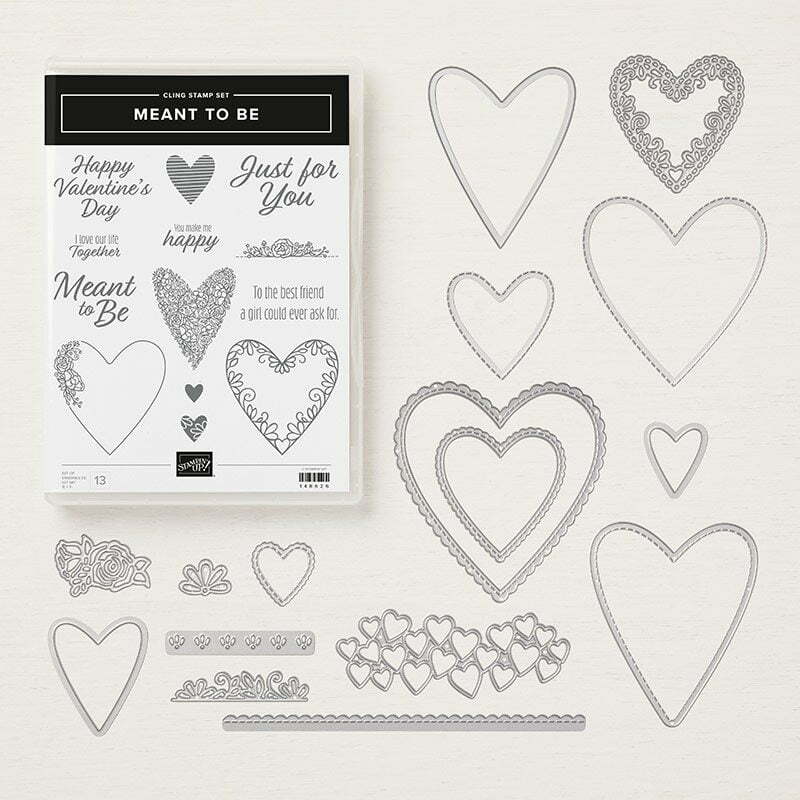 would love to offer one lucky reader the opportunity to win the Meant To Be bundle which includes 13 cling stamps and 16 dies! For an opportunity to win the Meant To Be bundle, be sure to leave a comment below by April 11th and tell us what your favourite Stampin’ Up! product is. If you’re not sure, be sure to visit their website to see all they have to offer. Meet guest designer Karin Åkesdotter! I’ve seen this set used a few ways. I love it and would love to have a chance to win! This set is totally lovable! Thanks for teaching me that you can layer paper, then die cut it. I wouldn’t have even considered it on my own, but it opens up so many creative opportunities! I love this set and one of my favorite products are your photopolymer stamps. They are just so versatile for cardmaking! Neat idea to use the border die the way you did. I never think of layering paper this way. My favorite SU product is the dimensional adhesive. There are many on the market, but I love having it from SU. Nothing goes to waste and the backings are easy to remove. I really love the textures and layers of this card! Just beautiful. This card is my favourite of all time!! 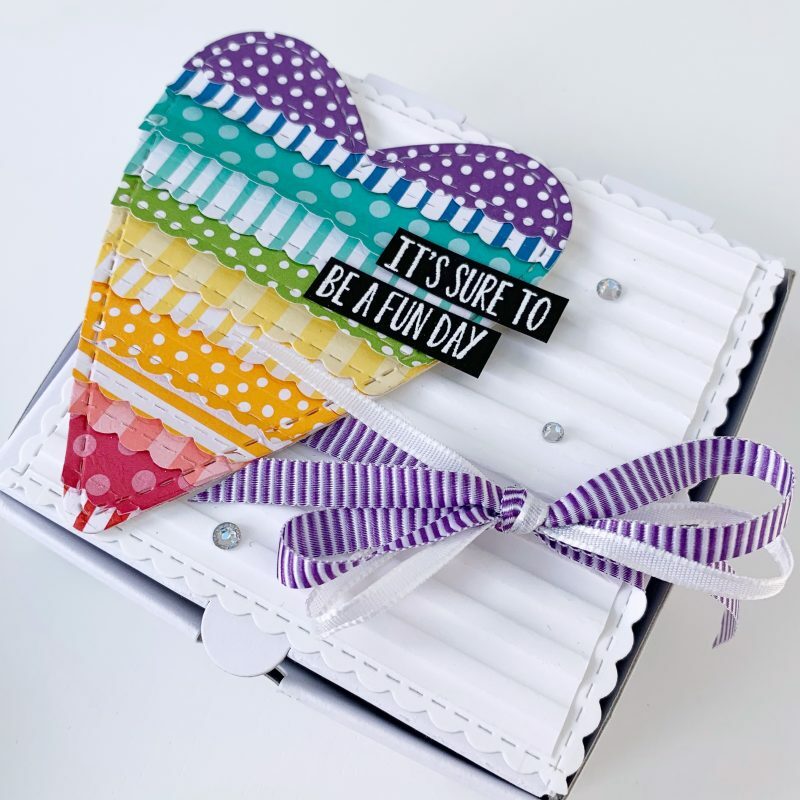 I just love the look created by using this stamp and die set. The “Be Mine Stitched Framelet Dies Set” is my favourite along with Dazzling Diamonds. Thank you for the opportunity to win this great prize. 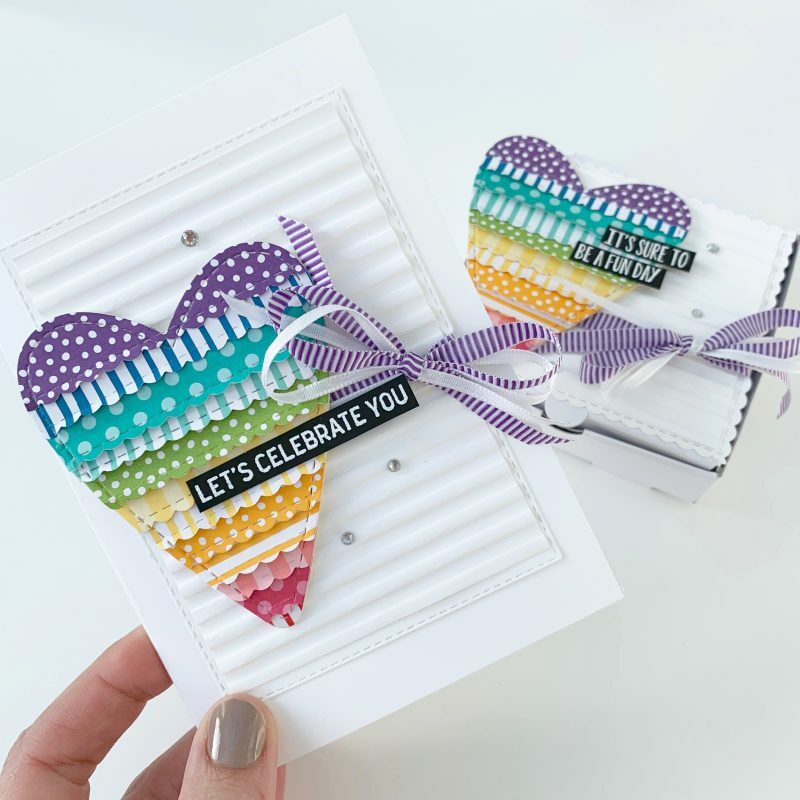 I love how Emma has used the border die to create the layers for the heart, she creates beautiful cards. I do love this bundle and the stitched hearts. My favourite SU product are the stampin blends, I am gradually increasing my collection with each order. Beautiful card! My favourite SU product is the owl punch! beautiful projects – love the needlepoint pp –perfect for getting that pretty embroidered look without the ‘hassle’ – lol!! I absolutely adore this design and I’ve saved it to scrap-lift soon!!! I have a serious love for all things SU! so it’s hard to pick a favourite – BUT if there was one thing I couldn’t do without, it’s the whisper white cardstock. It is definitely my go-to for white cardstock for all projects. In addition to be a “warm” white colour, it has a smooth and silky texture that I love. Thank you so much for the chance to win this great prize package! I. Absolutely love this set! The hearts are absolutely stunning and could be used for any occasion all year long! My favorite SU products are the new (to me) storage pieces! Genius! TFS! Love the hearts, so colorful and happy! My current fave product is the Flowing Fountain Stamp Set. Love, love, love the layering technique! I can see it used with other dies as well! I don’t know that I could narrow it down to one favourite Stampin Up Product….but if I had to….it would be the coordinating stamp sets and dies, that are incredibly well designed and thought out!! Love this layering technique! Would love to win it too! This heart collection looks beautiful! I love the scallop heart that you created. 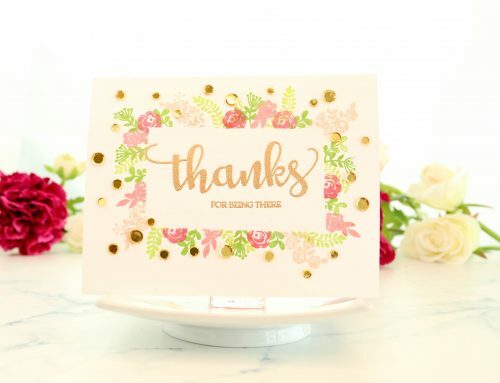 Thanks for the giveaway Stampin’ Up! I am a big fan of Stampin’ Up. The layered heart card is a great idea. My favourite stamp set is the Family and Friends. I am making a picture for the upcoming birth of my best friend’s new twin grandsons. The picture shows all the grandchildren with the grandparents, and I am able to personalize it with this set. I love the versatility of the SU products. Love these projects, especially the little mini pizza box! That would be my favorite SU product! As for ones that I own, I have a couple of very old background stamps that I continue to use over and over – they still print beautifully! Such a beautiful set! Thank you for the giveaway m Stampin’ Up! I have been a SU fan for 10+ years, and there are many products I love. Their ink pads are fabulous, and I love their Stampin Dimensions. Their stamp sets and coordinating dies are incredible!!!!! I love the laser cuts I recently purchased. So beautiful. I could not cut anything similar with an electronic cutter. Paper & ink. I love how everything matches. Makes making any project super easy! Wow! What a fantastic prize! I just adore heart shapes. I love that scallop layered card idea – definitely one to lift. I like the stampin’ dimensionals (of course!) and a stamp set called Wishing You Well. Oh I love this bundle! So fun and beautiful! Thanks for the chance to win!! Oh what fun, fabulous and super creative cards! Love the playful fringe effect. My current favorite SU product is the Wonderful Romance bundle. What a great project!! 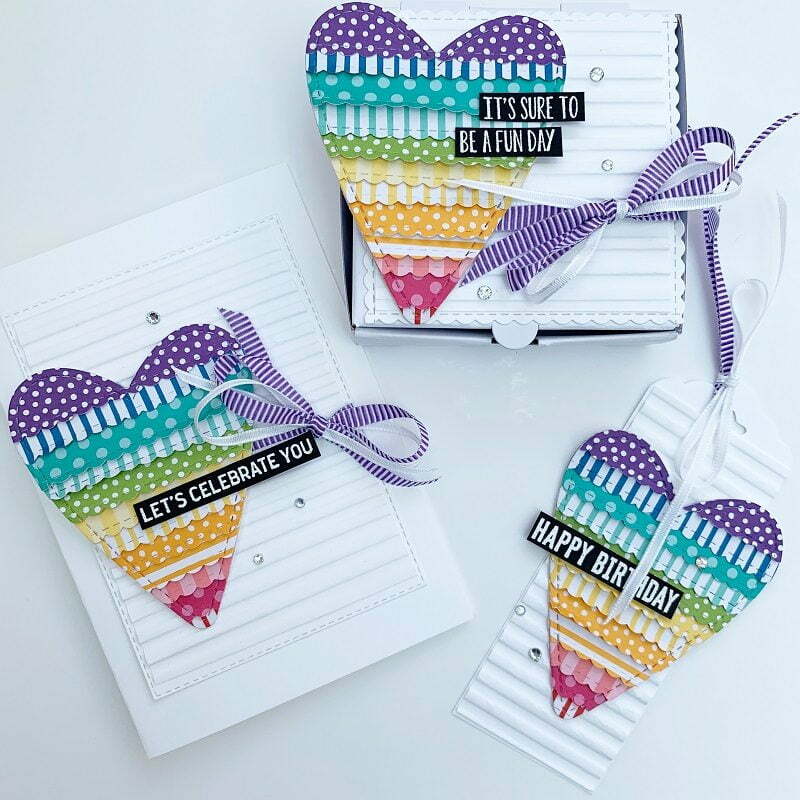 I love how you layered the strips before cutting with the heart die!! I love the Stampinup background stamps – the crackle paint background is super cool!! I love Stampin Up! Over the years I’ve bought many of their products but the first thing that came to mind as my favorite is their cardstock. 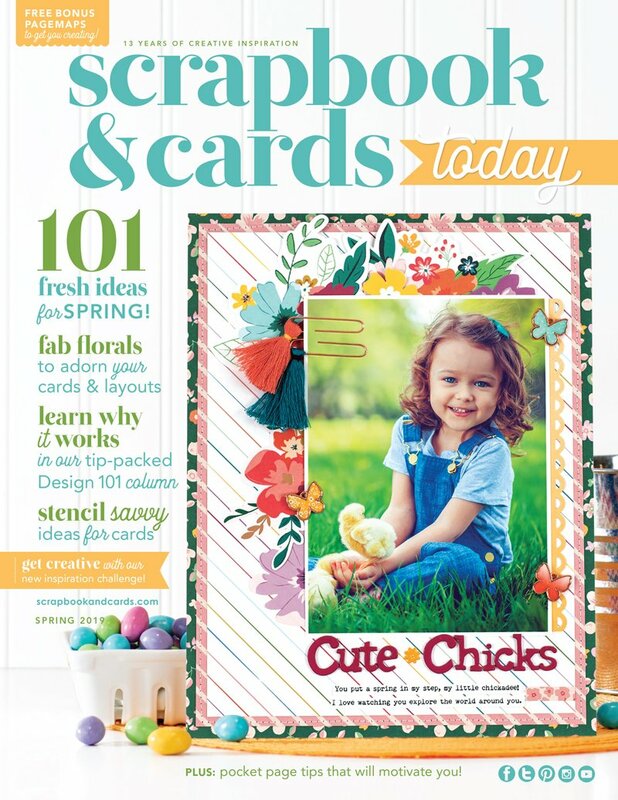 Their cardstock is perfect for card making as well as scrapbooking and other paper crafts. I love these projects made with the beautiful layered hearts. Would love to win this giveaway! I love the Stampin Up cardstock. I really like the punches that I have purchased from Stampin Up. They work well and are of great quality. And this card is fabulous…wonderful way to use up scraps! Wow! Simple, yes genius Emma! Just stunning, love that it’s actually fairly simple to make! Can’t wait to try this technique myself! What fun set of dies!! Thank you for the chance to win! Great projects. I’m a big fan of hearts, they’re a classic. Love, Love ,love this set. The SU ribbons are the ABSOLUTE BEST!!! I’ve had my eye on this bundle for a while now. So many possibilities with all those different hearts!! My daughters and I love all the stitched dies. They are so useful and really spruce up a card or project! Lovely cards! I love their punches, dies and stamps. High quality products. I love the new butterfly bundle from stampin up! Love their Coordination! Ink paper embellishments that match. Make my OCD brain very happy! Beautiful set of Birthday gifts! Love the Stampin Up Big Shot…couldn’t go without it!! What a fun idea. I love SU paper, just so many great colors. Love the layering on the heart and the paper you used is so bright and happy. SU card stock is one of my favorites. Simply darling! Love the fun colors which make me smile! Thank you Stampin Up for the inspiration! Stampin’ Up is one of my all-time favorites on so many levels. These hearts are adorable. That card and tag are something else…. I love that heart and long die! Love the idea of your bundle offers and especially this heart one. Like your background stamps too! I hear the cardstock is great too but have not used it. It’s hard to pick one favorite since I’ve been using SU about 20 years. Lovely as a Tree and Loads of Love stamp sets are standouts in my mind. My favorite stampin’ up! product is the Stamparatus! It’s amazing-love it!!! Ooh….love that stitched scallop edge die! Definitely adding that to my wishlist! 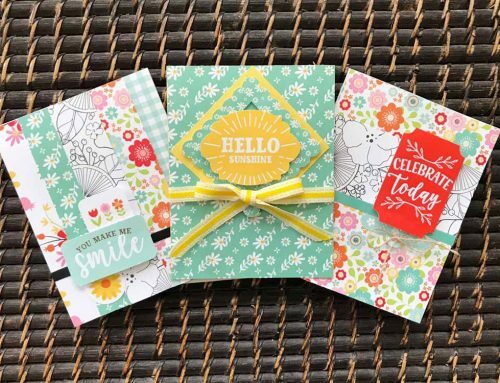 My absolute favorite is SU cardstock…love the quality and love the colors! Beautiful card! It is so hard to pick my favourite SU product. My favourite product is the succulent stamp set and matching dies. Thanks for the chance to win this great giveaway! Oh I love those hearts you made. Very nice. I bought the Eastern Beauty bundle last year and love it. I love this set and the dies are so versatile. What a great idea for the strips in the care. Such a great project. Stampin’ Up! Products are always so pretty. Thanks for the giveaway. Nice! I love stitch dies. Thanks for the opportunity to win. I love those projects – very elegant! Stampin Up is perfect for all the coordinating products. So cute!!!! I love my new Stampin Up paper cutter, ot’s the best!!! What a great card with my favorite heart shape. The die & stamp bundle would be so fun to use. Thanks for the chance to win!!! Love all these projects, the colors, the textures and what a great set of dies and stamps. The possibilities are endless, this set is like “the little black dress” one NEEDS it lol. I love Stampin Up’s new Storage units, you can adapt them to your specific workspace, plus if you decide to rearrange your crafty space or if you have to move you can re-arrange them to way you prefer. Thank you Stampin Uo for this beautiful giveaway. I love the way Emma had used this set it is so versatile. I love the rectangular stitched frame lets. I would love to win the set Emma had demonstrated. Wow! Wow! Wow! I’m totally in love for these amazing projects!!! One of my fave product is the Animal Outing Wood-Mount Bundle! Thanks for this beautiful chance to win!!! I’d love to win this bundle. Stampin Up are my favourite for cardstock and co-ordinating inks, ribbons and embellishments. Emma is so talented and her ideas are so inspiring. What a beautiful way to use the heart die! i don’t have any Stampin’ Up products but their ink pads look amazing! Awesome give-away! Love the heart dies. Besides the awesome stamps and dies from Stampin’ Up!, I have to say that my favorite product is their dimensionals. I go through a ton of them all the time. They are the perfect height for just a little dimension on my cards and scrapbook pages or I can double them up for an even bigger pop. You are offering up a beautiful set! I don’t own any SU products so I went and looked at their catalogues. WOW! So many great products to choose from. It’s difficult to pick a favourite, but anything with flowers always wins for me. I especially like the gift tag here. My favourite product is the paper trimmer – having both the cutting blade AND the scoring blade already in place and ready to use. My favorite part is the idea that I can make use of all those beautiful scrap pieces of paper by stacking a few of them and using the border die to cut them. The detail of keeping the glue to one side of the strip to give a ruffled look is great. My favorite product by Stamping Up is the high quality papers. Love this card! The ruffled look is so pretty. I like this cards so much and would like to make some cards like that with this wonderful sets. I love this paper layering technique . Great idea to die cut into a specific shape. My favourite SU product is my die cut banner set. It was one of the first due cuts I purchased and still used regularly. What lovely cards & so easy to make. I love the stamps from Stampin’ Up. My fave Stampin Up product is, & will always be, the inks! I love Stampin Up punches and designer paper packages! Very cute cards! My favorite SU product would be the card stock. NO ONE makes better card stock than SU! Love my collection of SU each piece has a spot in my heart , when I think I have the most precious the company comes out with a new oh I have to have that also…..the creation shown in this post is a must do and surly is a thought to build upon as well..
Wow. These cards are so pretty! Love that you were able to use those strips!!! Thanks so much for sharing! 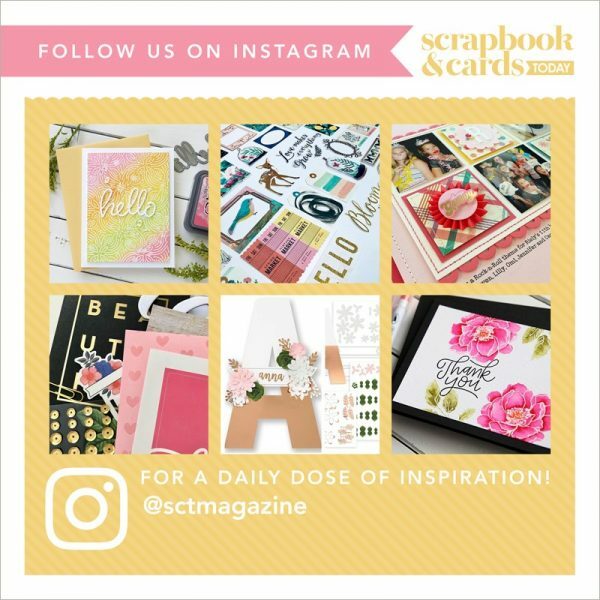 Hi SCT and Stampin Up! I am new to Stampin Up and went to my first party just a month ago. I am a scrapbook by heart but I fell in love with the texture type stamps and have been using them for backgrounds, I also love their paper it is such a good quality paper and how everything is so thoughtfully coordinated. I haven’t tried the dies yet but I am sure that will be next! My daughter just saw this post and said, “I Want THAT!” Such a pretty card. Would love to win the stamp and die set so I could try and make these. Thanks Stampin Up and SCT! I love the tutorial on this set!! Stampnup has great quality products! thank you for the change to win this great set! I ❤️ the Stampin’ Up! ink with matching paper. I’m happy that coastal cabana is back. Hearts are my favorite shape to decorate with! Any of their embossing folders are one of my favorite products. 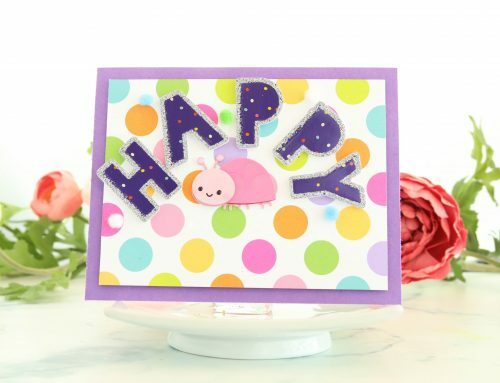 What fun cards with such pretty colors and details! I love these! Stampin’ Up has fabulous products! Their inks and cardstock are my favorites! Emma is always so creative, love everything she makes!! My favourite SU product right now is that set of heart dies….absolutely gorgeous and of course their cardstock is wonderful. Love these wonderful projects! 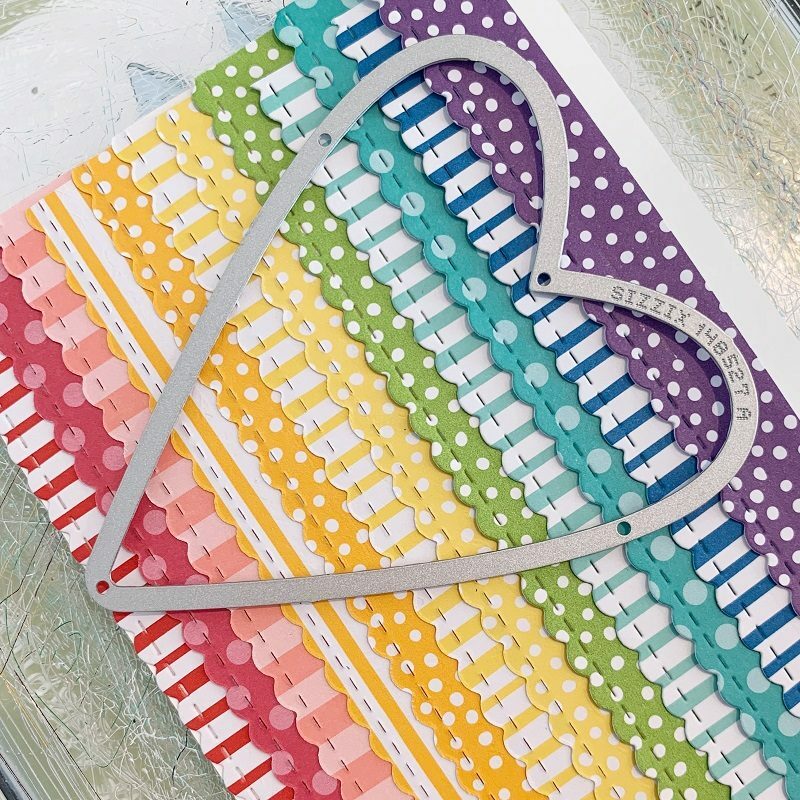 So Colorful and I love this idea of cutting strips and gluing together, then die cutting them out. Love Stampin Up! TFS. Sorry I forgot to add My favorite Stampin Up! Product… that would be their stamps and dies.i love so much of what they make it’s hard to choose. What a fabulous way to show off those pretty papers, great colours and lovely dies. So creative! Many thanks for the detailed instructions. I’d love to win this bundle; so versatile, it can be used for many occasions. I love so many things that Stampin’ Up! offers, it’s hard to choose a favourite. I’m going to cheat a little and say I love the colours…so that would include their cardstock, inks, Designer Series paper, markers, Blends and accessories. What a beautiful card! Such a clever idea to layer paper and then die cut. Stampin’ Up! never disappoints with their products so all of them are my favorite. But this heart stamp’s & dies combo may just be my favorite! This is such an amazing project! I unfortunately do not own any stamping up products so thanks for the chance to win! Awesome card–love it! 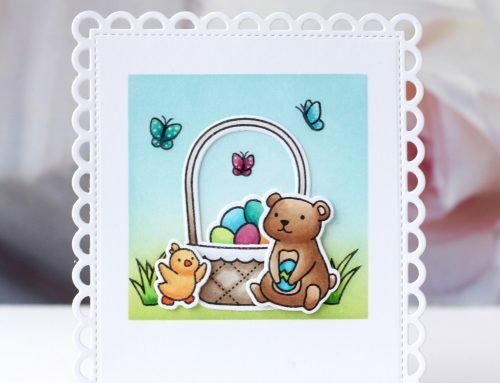 I am in love with SU Foxy friends stamp set–so cute! Thanks for chance to win a great prize package. This looks like an amazing die set and what a creative way to use it! Takes it way beyond Valentines! I love the SU stamps and dies. So many fabulous sets. Would love to add this one to my collection. Thanks for the chance to win! I was a Stampin’ Up! Demonstrator for over 10 years, so I’m a little biased. lol I just hosted a workshop at my home, and one of the items I purchased was their Stamparatus. I have all three sizes of the Misti, and both sizes of Tim’s platforms, but this one is special because it has two plates, which is awesome for 2-step stamping when doing mass production. Love it!